Give your bedroom casual Americana style with this complete poster bed. 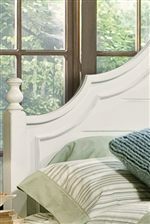 This bed is constructed of hardwood solids and poplar veneers in a creamy white finish with a slight rub-through that tastefully enhances the charm of this bed. This bed will complete your bedroom décor with its perfect blend of comfort and style. The Cottage Grove Complete Queen Poster Bed by Vaughan Furniture at AHFA in the area. Product availability may vary. Contact us for the most current availability on this product. 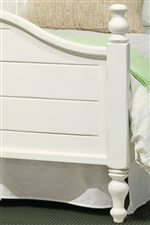 230-25H Poster Headboard 5/0 1 66" 3" 60"
230-25F Poster Footboard 5/0 w/slats 1 66" 3" 32"
230-25R Poster Bed Rails 5/0-6/6 1 81" 5" 2"
Beautiful casual Americana style is the Cottage Grove collection. 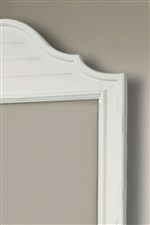 This collection is constructed of hardwood solids and poplar veneers in a creamy white finish with a slight rub-through that tastefully enhances its charm. The beds in this collection are offered in twin, full, queen, and king sizes. 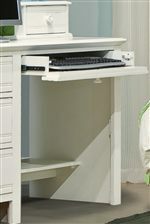 For your youth, there is also a charming desk and hutch choice. The Cottage Grove collection is the perfect blend of comfort and style. The Cottage Grove collection is a great option if you are looking for Casual furniture in the area. Browse other items in the Cottage Grove collection from AHFA in the area.